This is, quite simply, a very lovely book. 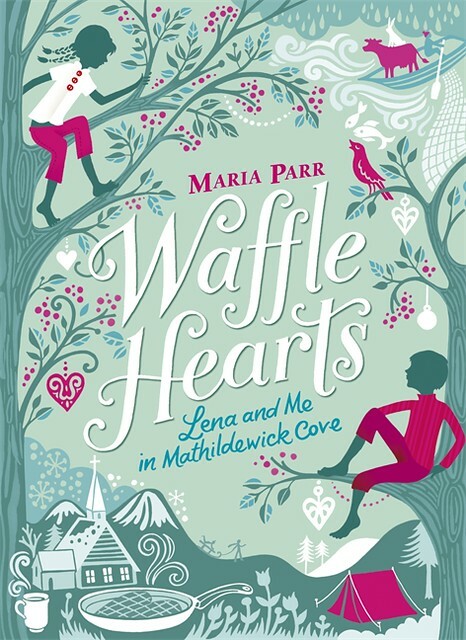 I missed Maria Parr’s Waffle Hearts when it was first published, and am so glad to have caught it now. It was lying around when Son was visiting and he picked it up and informed me it had been translated by his friend (Guy Puzey), as though I ought to have known. I’d never heard of Maria, either. Seems she’s big in Norway, and Waffle Hearts is the kind of book that has won a lot of awards, except we haven’t heard of it here. But think Astrid Lindgren and The Six Bullerby Children, and there you have it. Set in Mathildewick Cove, somewhere near the sea in Norway, 11-year-old Trille (he’s a boy, before you go getting the wrong idea) lives with his family and relatives in this small hamlet. Probably smaller than a hamlet, actually. And next door lives Lena, who is his best friend. She is a bit crazy, and life is a lot more exciting when she’s around. It’s just that Trille fears she doesn’t like him as much as he likes her. It’s not just sweetness and old-fashioned happiness, however. It gets sad, too. Really sad. You’ll want to read this, even if they do spread butter and sugar on their waffles.